Play-Doh is a source of endless fun for my kids. They love it when I let them get the Play-Doh out to play. 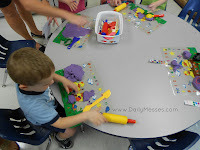 Higgins' school even has play-doh and tools out for kids to play with during the day. Did you know Play-Doh was originally made in Cincinnati, Ohio as a modeling compound (reusable, non-staining, and non-toxic) to clean coal residue off of wallpaper? Local school children began playing with it and using it to make ornaments for Christmas. With a decrease in the use of coal to heat homes and new easier to clean vinyl wallpaper, the Kutol company began to fail. When the company learned about children playing with it, they re-marketed the product and began selling it to department stores as a play item for kids. The Rainbow Crafts Company was then created to make and sell Play-Doh. 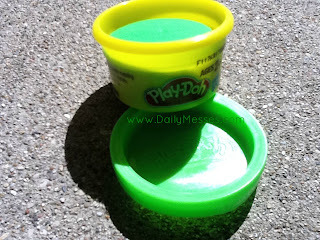 In later years, others companies bought Play-Doh (General Mills/Kenner Products, Tonka, and finally Hasbro/Playskool). 1. Mix together cream of tarter, salt, and flour in a sauce pan. 2. In a bowl, combine water, food coloring (about 3 drops), and oil. 4. Remove the dough and knead until smooth and free of lumps.